Last week we have been doing a 7-day challenge in our ‘Poker & Life Mastery Community‘, the topic was going “From results- to Process-oriented”. This has prompted me to write an article about the usefulness of checking the poker graph. It is a well discussed topic in the poker world, and something that comes up from time to time in my work with poker clients. One thing I haven’t heard yet from poker players (and I have been in the poker world as a player and the last couple years as a coach) is that checking the poker graph helps them to play better, and make better decisions. I want to say right in the beginning is that looking at the poker graph I believe is neutral. Not good, not bad. However since we are humans, and have our own personal thinking, it usually causes some problems for players. If you check it during sessions, it can generate excess thinking in your mind that takes up some of your mental bandwidth that could be used on performing at your best. It can trigger personal thinking about your performance, your results, your image as a player, and so on, and if you get caught up in that you are out of the flow, and it limits access to your best. What I refer to by personal thinking is which on some level about you, or I could say your personal identity. Thoughts about the poker being unfair, making mistakes, what other people might think of you, whether you will make it or not in poker, etc. is usually about you. When you are in the zone, the small self, or “little me” with the personal thinking in your mind is almost non-existent, and that’s why there is no resistance, you are in the flow and doing your best. You still might have thoughts appear but they are rather observations of the situation/facts, not about your small self / “little me” / ego / personal identity. We can refer to it by many names. If you are not watching the graph during the session but after it, or end of the day, looking at it can be a problem for the same reasons basically. It causes excess personal thinking. And our only problem we ever have is getting caught up in it. That’s the thing that usually stops us from creating great results. What’s behind checking the graph for you? Take a couple minutes, and remember back at times, and find out when you look at it, and why. What emotional/mental state are you in when you get the urge to check it? What do you secretly hope to gain by the behavior? Though our behaviors might not make sense sometimes, but behind the scenes, looking at it from our mind’s perspective it perfectly does. Same with any behavior, and poker graph checking as well. There are players who look at it constantly during session, some do it after session, end of the day, end of week, end of month, or as one of my past clients did at the end of the year. Different players can look at this behavior differently. For some constantly looking at it might come from an inner feeling of insecurity and uncertainty, and unconsciously trying to gain some certainty and stability. Basically I believe we could name many separate reasons, but most of the times underlying all of them is the above. Having an insecure state of mind (which usually comes from being lost in lot of personal thinking), and trying to gain some stability/certainty. Because even if someone sees the results are not good, at least they are not stressed from the unknown. So the total solution might not be to just not check the graph, as it might just provide a patch on the symptom. But rather getting back to it’s cause: being lost in an insecure state of mind, and thinking this is the way to resolve that. Understanding deeper where our feelings really come from and how our mind works, can help a lot in having more sense of stability within us, regardless of circumstances, and so our mind doesn’t try to get that stability through certain non-supportive behaviors (checking poker graph constantly, overeating, drinking, smoking and so on). Also reflecting on the fact that what actually helps you reaching your poker goals and what doesnt, might make you look at poker graph differently. When you start finding more trust in the process, and find yourself more in your inner well-being, you accept more the part of the process and let the result take care of itself. You define the key tasks you need to perform (like playing x hours a day, studying x hours, etc.) and accept that all you need to do is to show up to these tasks every day, not get in your own way by getting lost in personal thinking, and just perform the tasks. This will help you let go more of this inner need for results now, and have more trust that it will take care of itself. Only thing you need to do is focus on what you want, show up to your tasks each day, see how you can still improve constantly, and trust the process. If you focus on those things, you don’t have to worry of the graph, you are fine. We all have habitual thinking and behaviors that we do unconsciously, because on some level it makes sense for our mind. When we cause a glitch in that process, meaning you mess up that habitual way, your mind can have new thought occur, and with new thought you look at it differently, and might act differently. 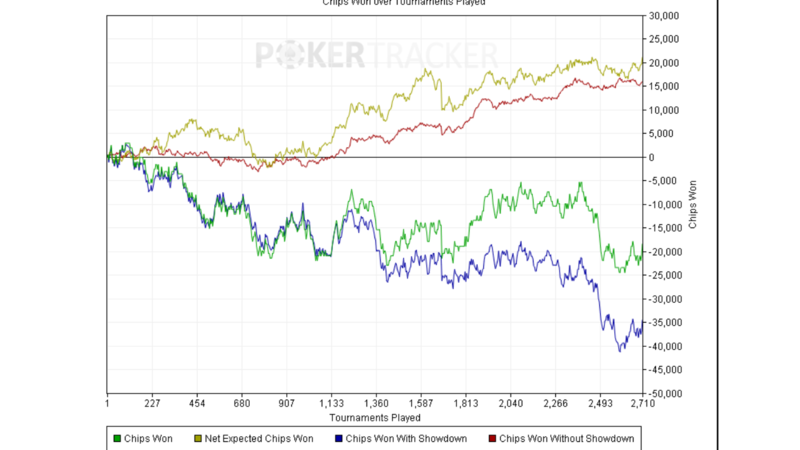 So what I like to do with clients is to tell them to do a 7 or 30 day experiment of not checking poker graph. And while they do that they might realize that it’s not that necessary, and are able to play more and perform better because of it. I recommend give it a try as well, and try to find an inner sense of stability in other things / thoughts than poker graph. It might be useful to take off that tab from your HM or Poker tracker for a 7 – 30 day period. And just play with it, look at it as an experiment, do the opposite. You will survive it, and might come out gaining some cool lessons in the process. Let me know your feedback, comments and questions about the topic in the comments below. And feel free to share what has worked for you about this subject.